Qatar Airways’ first daily regularly-scheduled Airbus A350 service to London Heathrow arrived in the United Kingdom on Sunday 30 October, as the airline introduced the state-of-the-art aircraft on the route, complementing the existing ‘best of fleet’ on its six daily flights from Hamad International Airport. The Qatar Airways Airbus A350 represents the pinnacle of modern aviation technology, offering enhanced benefits for both passengers and an environment that provides a unique and unrivalled experience. The aircraft joins the airline’s Airbus A380, Boeing 777 and Airbus A330 aircraft currently operating the route. To mark the occasion Qatar Airways followers on social media were able to follow a live tour of the interior cabin of the A350 while on the ground at London Heathrow. 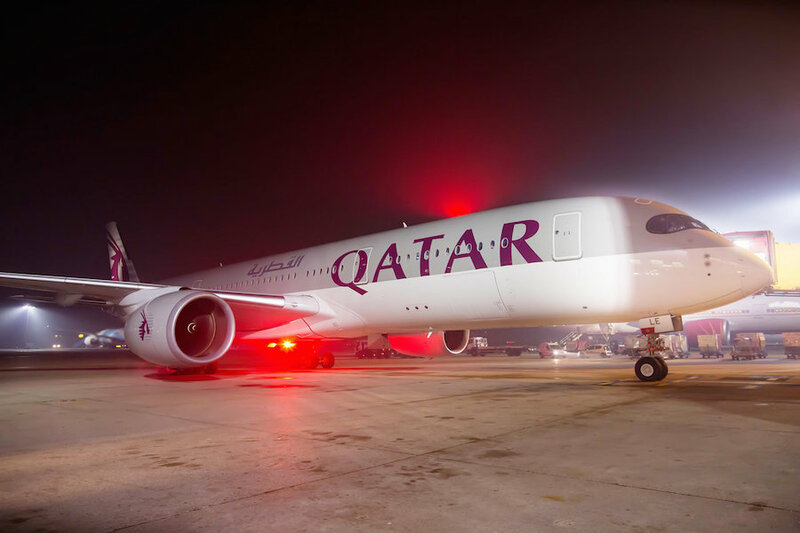 The landing of the A350 on Sunday 30 October also marked another milestone for the airline as it took place on the same day as the start of a new joint business agreement between Qatar Airways and British Airways. The agreement benefits customers by offering a wider choice of flights by code sharing on all seven Qatar Airways and British Airways direct daily flights between London and Doha. Whether travelling for business or pleasure, a journey with Qatar Airways on the A350 is like no other. The state of the art Oryx One entertainment system offers up to 3,000 entertainment options and passengers can stay connected throughout their flight with Wi-Fi available across both cabins. Offering wider seats in both Business and Economy Class, combined with the lowest cabin noise levels of any aircraft, advanced air conditioning technology and programmable LED lighting, the resulting environment allows passengers to arrive at their destination feeling relaxed and less fatigued. The Business Class cabin of the A350 has 36 seats in a 1-2-1 configuration featuring an 80-inch fully-flat bed and 17-inch HD in-flight entertainment screen. Economy Class features 247 18-inch wide seats in a 3-3-3 configuration, each with a 10.6-inch in-flight entertainment screen, and more space at shoulder level for passengers in window seats due to the vertical sidewall panel design. Qatar Airways was the global launch customer for the Airbus A350 XWB in January 2015 and currently operates 11 A350s, with a further 69 on order, across its global network. It is the first airline to fly the A350 to three continents, the first airline to fly the A350 to the United States, and the largest operator of the A350.